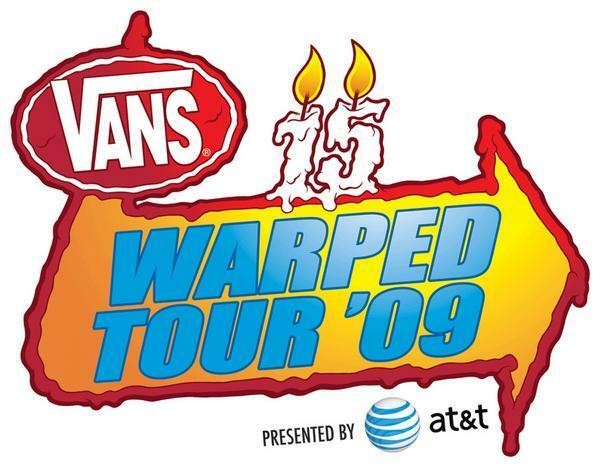 I swore that 2008 would be my first and last Warped Tour after $4 water, 104 degree heat and a mediocre band list. Then I saw the 2009 lineup and broke my own promise. Fortunately, the day did not disappoint one bit, minus me forgetting sunscreen and refusing to pay $8 for a shotglass-sized container. Even a few days later, I’m still sporting my Warped Tour farmer’s tan, along with a smile. And now, what you’ve all been waiting for: the bands. Underoath – Score: 2.5/5, with a little leeway due to tech problems. This is the second time I’ve seen Aaron Gillespie, and the second time I’ve been unimpressed. His vocals were simply off, and while I know it is difficult to play metal drums and sing simultaneously, if you can’t play it live, then don’t do it. Some tech problems made things sound a bit strange, and everything just seemed a tad wrong. Four songs in and I was through, and because of the packed bill this year at Warped, I bailed early to catch the tail end of Scary Kids Scaring Kids set, so I’ll give the band an incomplete asterisk for their own benefit. Still though, a very forgettable set. I will unfortunately have to hand out another incomplete here, as the inflatable canopy for the Hurley stage collapsed right after “My Darkest Hour.” Of the 2 ½ songs we heard, they were sloppy, sloppy, sloppy. So, so, so great. I truly believe this band has what it takes to make it big. Vocalist/hottest musician of the day Sierra Kusterbeck was right on, hitting every note that came her way. Precision is definitely a strong point for VE, who played as one cohesive, accurate unit the entire set, from bigger songs like “Whisper” to slower tracks like “Clocks.” Great mixture of live music and samples to get their sound, and a band I would recommend to anyone. This band’s members had to be the oldest people playing Warped, barring Bad Religion. However, their set was perfect. A great combination of songs from the old EP and recent full-length made for a fun, high-energy show. Alex Correia’s transitions from screams and shouts to clean vocals are unique and different, supplemented greatly by Brian Marquis’ harmonies. The band packed a punch and have a great sound. Another band that I hope gets ridiculously famous in the near future. It wouldn’t be the first day of Warped Tour if there weren’t technical problems, as Thrice learned firsthand. After their first song, Dustin Kensrue seemed to have some problems with his guitar, which cost the band a song or two of set time. After everything was fixed though, Thrice put on the effortless perfect show they always do. It’s amazing how this band non-chalantly always puts on killer sets. After blasting through “Deadbolt” and “Fire Breather,” the band unveiled a new song, entitled “All The World Is Mad,” a bass-heavy track that was a tad different than their other material, but still powerful. “The Earth Will Shake” was definitely one of my top 3 songs performed this tour. The word is out on ADTR. I showed up 5 minutes before their set and felt like I was a half mile from the stage. Certainly the biggest crowd I saw that day (the girlfriend claims that 3Oh!3’s crowd dwarfed it, though). ADTR is just so fun to witness live, no matter if the band is hitting on all cylinders or playing out of sync. Jeremy’s vocals seemed a bit weaker than the last time I saw them, probably because this time around the group played more songs that utilized his falsetto. Mike from TDWP appeared for “I’m Made of Wax, Larry,” possibly the best song of the day. These Canadian rockers were the kicker that made me come back to Warped Tour, and they didn’t disappoint. Opening strong with “Young Cardinals” worked out well, especially as it transitioned into “This Could Be Anywhere In The World.” Each of the three vocalist were astounding, especially the always-amazing Dallas Green. While I loved the mixture of Crisis-era and Old Crows/Young Cardinals material, Watch Out! was completely absent from the set, which was a tad disappointing. Definitely one of the best bands at the tour. One last thing: watch your head. George made several vicious stage dives at the end of the set, successfully kicking over the first three rows of people. I realize that DGD makes their living off of their weirded out math rock, but you HAVE to play ONE of your hits. Granted, I assumed that the “And I Told Them I Invented Times New Roman” sightings would drop significantly now that Kurt Travis has two albums under his belt, but there is no excuse for not playing “Me and Zoloft…,” the band’s lone single. I was not a fan of their set at all, which featured more Happiness tracks than anything else. “Tree Village” served as a great opener, but the rest of the songs were just too out there, minus “Uneasy Hearts Weigh The Most.” The crowd had no clue how to react, standing with arms by their sides and confused looks nearly the entire time. To their credit, they did play everything near perfect (though without any power whatsoever), but without a proper set list, any show can be spoiled. Overall, it was an extremely enjoyable Warped Tour. I would have liked to see 3Oh!3, Saosin, A Skylit Drive, Hit The Lights, Senses Fail and a few others, but I’m more than happy with my experience. Fun times, folks.